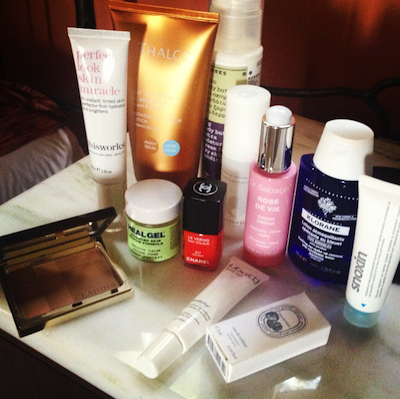 This Bedside Beauty Snapshot is a special holiday edition. The products shown were my most-used when I was away in Greece and you’ll have seen a few things before – especially the Heal Gel, which I’ve harped on about loads this year. Surprise product? The disgustingly-named Snoxin. I really like it! Who the hell thought of that name, though? It’s off-putting beyond all reason. 1) Clarins Bronzing Duo in Shade 03, find it here. Lovely smooth powder that offers a paler shade for a healthy glow and a darker shade for a more contoured look. I just sweep my brush over both! 2) Perfect Look Skin Miracle, see review here. 3) Heal Gel, see review here. 4) Thalgo Bronzing Activator Lotion. I used this as a body lotion before I went on hols and then as an aftersun whilst I was away. It helps to develop an even, beautiful colour and I’m sure that it makes me look more bronzed than I actually should be, considering that I spent a lot of time in the shade this year! It’s £24.50 here. 5) Korres Fig Body Butter, £12.50 with free worldwide delivery here. Thick, nourishing, smells beautifully figgy. Perfect for a Greek holiday! 6) Omorovicza Queen of Hungary Mist, see review here or you can buy it here. Pretty much my favourite facial mist. If Caudalie’s Elixir is a little strong and overpowering for you, then this is the more refined older sister. More expensive, but well worth the extra if you can spare it. Great for long journeys, home facials, pre-moisturiser pep-ups. The bottle shown (tiny, white, between Korres and pink serum) is from the Omorovicza travel set. 7) Chanel polish in Holiday. Perfection in a bottle. Get it here – it’s limited edition, I think, so when it’s gone it’s gone! 8) Dr Sebagh’s Rose de Vie Serum. Incroyable, but incroyably expensive too. Comes in a box big enough to park a Boeing 747 in. Review coming up soon, if I have any serum left to review. Mr AMR has become addicted to the stuff.. It’s £129 here if you want to take a further look. 9) Lubatti Wonderlip. A beautiful, soft, plumping lip balm. Perfect before lipstick, lovely as a night treatment. If the price-tag’s too steep (see here) then have a look at La Roche Posay’s Ceralip. 10) Klorane Eye Makeup Remover. One of the gentlest, one of the best. And it’s only a fiver. Find it here. 11) Mini Diptyque Sample – Philosykos. Figgy, great. Review next week.